Several Chinese stocks and ETFs are available to U.S. investors. Here's what you need to know about how you can invest in China. Chinese companies present a potentially huge opportunity for investors, but the market in China carries unique risks and challenges that bear consideration. Here is how to invest in shares of Chinese companies and exchange-traded funds (ETFs) available for trading in the U.S. Investing in China can be a real trick as companies there carry various share classes that may or may not be accessible to the average investor outside China. For example, A shares are shares of a Chinese company that are only available to investors in mainland China. H shares, on the other hand, are shares of those companies that trade in Hong Kong and are available to anyone -- assuming your broker allows you to trade on the Hong Kong exchange. Data sources: Yahoo! Finance. TTM = trailing 12 months. In addition, some companies, such as China's largest social network owner, Tencent Holdings, are available on over-the-counter markets. In all, some 300 Chinese companies can be traded in some way stateside. The work in filtering through those can be difficult, but an easier option also exists. The fund holds shares of Chinese companies that are available to all international investors. The fund is composed of Chinese companies whose shares are listed on a U.S. exchange. The fund holds A shares of the largest 300 Chinese companies that only trade on a Chinese exchange. Data sources: iShares, PowerShares, and Deutsche Bank. 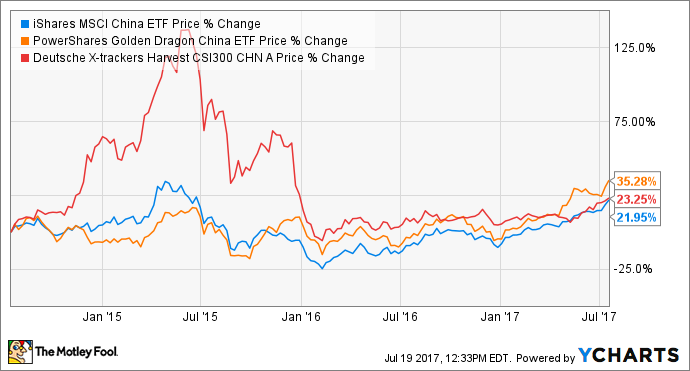 When investing in Chinese stock ETFs, investors have three basic choices: stocks listed on Chinese stock exchanges, international investor shares, and companies specifically listed on U.S. exchanges. The DB X-Trackers fund, which holds Chinese exchange-listed companies, has had the wildest performance due to the bubble-and-bust China market of 2015. Because of the extra risk involved, owning shares in China's fast-developing and changing mainland economy may not be the best route to take for the faint of heart. Of the two funds that own shares of companies listed outside of the Chinese stock exchanges -- iShares MSCI China ETF and PowerShares Golden Dragon China ETF -- PowerShares Golden Dragon and the companies it owns listed in the U.S. have fared better. Some, but not all, of that has to do with the extra risk with fluctuating foreign currency exchange rates. Listing on major U.S. exchanges has also helped moderate the roller-coaster movements that investing in an emerging economy can present. For investors who want to bet on the future of the Chinese economy, there are plenty of options. There are more individual companies than ever available for trading for those of you who don't mind the homework, and a myriad of ETFs can help you get broad exposure to the whole market. Whichever option you go with, be prepared for a roller-coaster ride as China's economy continues to modernize.